The UCI has announced a sweeping deal “to transform cycling in China”. In more practical and grounded terms this means a new men’s World Tour race, a women’s race, mass participation events and the creation of a new satellite of the UCI’s World Cycling Centre. There’s lots to cheer and some concern too. Background: sports are increasingly a big deal in China. Xi Jinping, China’s “Paramount Leader” and General Secretary of the Communist Party of China, President of the People’s Republic of China and Chairman of the Central Military Commission doesn’t just like his job titles, he’s a sports fan, especially soccer. Xi has expressed a dream for China to become a world force in football. One policy is co-opting China’s billionaires into paying for this, a pact where such prodigious wealth is accepted and directed towards politically-approved aims (similar to Russia where patriotic Kremlin insiders bankroll pro cycling teams). Jack Ma, the founder of Alibaba, a website, backs China’s top football team and also funds the development of other sports in China like rugby. 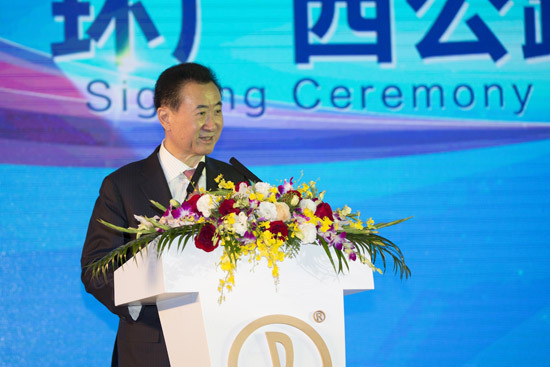 This brings us to Wang Jianlin, reputedly China’s richest man and the founder and owner of Wanda Group – sometimes called Dalian Wanda – a real estate venture that’s mushroomed into a media, entertainment and sports conglomerate. Mr Jianlin has already bought a stake in Spanish football team Athletico Madrid and Wanda sponsors the Chinese football league and funds a programme called “China’s Future Football Stars” which coaches China’s best young players and takes then to Spain for more development. Wanda is busy in other sports too, it bought the World Triathlon Corporation, owners of the Ironman brand. It’s in cycling in several ways too and you may remember it acquired Swiss sports agency Infront which part0owns the Tour de Suisse. Now it gets its second World Tour stage race meaning it’s third after ASO and RCS in terms of World Tour race days. Today’s news: The headline news in the press release is a new World Tour race in Guangxi, a southern region near the Vietnamese border that’s scenic and should be pleasant to visit in October: warm but the typhoon season has passed. The smog horror of the now defunct Tour of Beijing is long gone. Comparisons with the Beijing race are inevitable and this should be a better event, for starters it takes place in a scenic region during the high tourist season compared to Beijing with its regular pollution alerts. There are no firm dates yet, just October is cited, but presumably and hopefully it will come soon after the Tour of Lombardy and before the Tour de France route announcement and not clash with the crowd spectacular that is the Japan Cup so as not to tread on toes. Still an October slot means it’ll be hard to drum up interest. In January many of us will get out of bed at 4am to watch the Tour Down Under or watch a low-fi livestream of a race from Argentina just because of the promise of the new year; come October season fatigue has set in. However it could get the locals excited which matters – see Qatar or Abu Dhabi – and there will be a mass participation event open to all – gran fondos are taking off in China too – and even an educational programme to get schools interested. There will also be a women’s race but this won’t be on the World Tour yet and it’s not clear if it’s a one day event or a stage race. After the race there will be the UCI Gala, cycling’s end of season awards show that has yet to get in its stride (it could do with a livestream padded with a Sporza-quality season review in video and for more riders to attend in order to draw in the public but that’s for another day). There will also be a new Urban Cycling world championships which means eliminator XC MTB, BMX and trials, a sort of extreme games held in an as yet undetermined Chinese city and it’ll remain in China for three years, implying the UCI has granted the concession to Wanda for this period. The World Cycling Centre (WCC) is the UCI’s development programme where it uses its HQ in Switzerland with its velodrome and nearby roads to bring over riders from all corners of the world in order to race in Europe, they even have a team in the Tour de l’Avenir as well as offering other courses to help budding mechanics and more. There are already existing WCC satellites in Japan, South Korea, India and South Africa. Now there will be one in China and about time, Chinese cycling is large and growing but the top of the pyramid has little to show: Ji Cheng has been the country’s most visible pro but his success is that of a pioneer rather than a champion, the “first Chinese rider” to start a classic or to finish a grand tour. One difference is the role of Wanda. 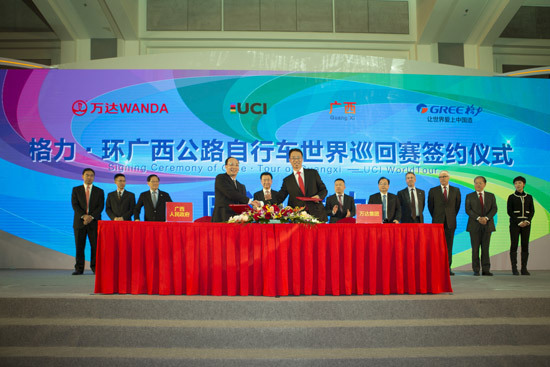 The press release says “Wanda Sports will build a cycling centre” and “promising athletes will be supported and funded by Wanda Sports” which suggests development is being handled by Wanda company rather than the local federation, the Chinese Cycling Association. It’s ironic for communist China to see a role normally done by the state-backed federations outsourced to a private corporation. Wanda rings stars: a new World Tour race in October? At first glance an unknown event and a lacklustre calendar slot doesn’t bode well, it can take years for a new event to establish itself. But this race is ambitious and will have to do something to grab attention. Already Wanda is close to the Velon teams and they will surely commit to this race and supply some of their best riders. Now Velon’s already a deal for the Abu Dhabi Tour but this alone hasn’t been enough to get anyone excited. So we can expect more, perhaps much bigger appearance fees to the star riders to tilt them away from going on holiday. Put simply if the Chinese public are expected to cheer on a peloton of foreigners they’ll surely demand the reigning world champion, the Tour de France winner and other cycling celebrities and figureheads are there. Mr Jianlin probably won’t settle for less. We can imagine other incentives and headline grabbers. Think of a prize list that is bigger than the Tour de France for example. So far so good: the deal is so big that there’s complexity and risk. There are obvious conflicts of interest, for starters the men’s World Tour race is going to appear on the calendar for 2017, another example of the pro cycling’s DIY tendency where a significant stage race is added after teams complete their recruitment (although the race has on the grapevine for a while now). More fundamentally we see an untested race fast-tracked into the World Tour, presumably quid pro quo for all the money Wanda is spending on UCI initiatives and with pledges that it’ll meet the minimum standards, the cahier des charges. The point here is that the UCI has entered into a very close relationship with Wanda to fund world championships, awards ceremonies and rider development – the sums are unknown, we’ll wait for the UCI’s annual report – so that if the World Tour race had issues and wasn’t up to technical standards could the UCI demote it? Similarly the women’s race won’t be World Tour yet. What ever the reason it signals that it’s not a priority: the men’s race is fast-tracked, the women’s race is isn’t despite being. It’s good there’s a women’s race but loyal readers will remember that it’s a UCI rule that all men’s World Tour races have an associate event that contributes to the sport, for example a women’s or junior event be in La Course or the U23 Tour of Flanders and so on. Finally this dips the UCI deeper into the perpetual conflict and Kremlinology in the sport as it’s now announcing deals with Wanda Sports in a way which it isn’t to the likes of ASO and RCS. Also Wanda is contractually-linked to the Velon consortium of teams too. Cycling’s goes up a gear in China with this news. Some comparisons will be made to the Tour of Beijing but that saw the UCI as the race promoter, today’s announcement has the governing body working with a Chinese firm, linked but owning the race. Beijing had smog and this won’t and today’s news comes with a broad base of measures from mass rides to development programmes rather than just a World Tour race crowbarred into the calendar all of a sudden. If the substance of the news is welcome, the manner of some of the deal raises questions. Again we have an event awarded a premium World Tour label only it’s untested, only ten months away. Similarly the governing body that says yes to the men but no to the women. More broadly the fate of development cycling’s development in China is now intrinsically-linked to the fortunes of a company and its high profile owner rather than a national federation. Thanks for highlighting this, I’d missed the news and it’s arguably one of the bigger stories of the year. The details will be very interesting indeed, hopefully they’ll go some way to allay the concerns noted above, which I share. As a side note, I’m keen to watch a highlights package of each day of racing, say one hour long. Subject to InFront getting their act together and producing a good package. That’s it. I’m done with international cycling. It has become to formulaic and boring just like F1 and like F1 the dregs of human rights violators and oligarchs have become accepted and that is just to much for me. I will always ride, but I just can’t ever see myself being a race fan ever again. You’re not alone. That was my reaction, too, this was the last bit it needed to push me away. I am also done with professional cycling, as sad as that is. Hah! A great joke from both of you. Or a hysterical reaction to something or other. Yes, having principles. How ludicrous. I just don’t watch these sorts of races – on sporting as well as ethical grounds, usually (this one may have a decent parcours, we’ll see). Not sure this is necessarily the same as the Middle Eastern races, which are organised directly with (subsidiaries of) the regimes. Clearly, China’s businesses are not completely independent of the ruling party, but they’re not as directly linked as elsewhere. As to the parcours, I agree that time will see. China is massive with a vast range of different terrains, and this area looks pretty hilly. I hope you view the website and post your principles on a a computer with non-Chinese parts and watch races on an equivalent tv. Good luck with that. No, I try to avoid buying Chinese as much as possible, but it’s not completely possible – unless I wanted to live without electrical goods. But F1’s VELON’s wetdream. And it gets worse – they’re going to shove disc brakes down the rider’s throats! Henri Desgrange must be doing 360’s in his grave. I read where a poll indicated one option was to force the entire peloton to use disc’s. Must say, in mag’s, articles etc. once I see a bike photo with disc’s, I immediately turn the page. Who on earth wants them other than bike companies??? Stinks! (I understand some people do but overall pro’s don’t want or need them). Taking away a team or rider’s option is a company lobby maneuver and it is directly related to bike weight. The order of things that is: policy, is important here for how it will maybe effect future outcomes. Lobbyists in the bike world are similar to lobbyists in the political world. MANIPULATIONSHIPS matter. This relates to the article I’m commenting on because there is some aggregate FLEEING feelings about cycling due to some decision makers who are in essence being influenced for the sake of money and bike companies wishes RATHER than committed to the bike. I feel as though many commenters here have a better grip on reality and what I’m expressing and want to hear other thoughts to see if I’m mistaken. -Is this not a rational thought I’m harboring? -and thanks ahead of time. Hydraulic rim brakes would probably be even better. In reality though the limiting factor (apart from human factors) on bicycle brakes is tyre grip. It is easy to lock a wheel with a cable actuated rim brake even in the rain. I’m always amused by cyclists who claim that discs are “safer” because” it will reduce “pileups”! LOL, as if stopping power was the culprit! Many videos show of flipping over the bars, with rim brakes. “Pileups” ares nearly always because of rider reaction times, or road hazards. Other cyclists give excuses the could descend faster, if “only” they had disc brakes. These are same cyclists who get passed on downhills by 70+ yr old grandmothers. In many cases the riders clamoring for disc brakes are relatively uninformed & unskilled “social” riders. Just to be clear, I was NOT referring to Noel or any other people on this post! These are comments others have made to me, as to why discs are “safer” or “better”. I even heard one guy say discs are “better” for criterium racing! For non-USA readers, a USA-style crit is typically a virtually flat, short course (1-1.5 miles). There’s hardly any braking, except for light feathering of brakes. I finished with Grand Tours after Nibali’s remarkable upturn in performance during the Giro. I sort of figured that there was next to no one riding both legally and ethically clean last spring. There was rarely anyone who spoke about abusing TUEs back then, bar Paul Kimmage. Do you think it is really fair to strip the hundreds millions of cyclists in China the Fun & Joy of professional cycling races because things did by the government the people had no control of? Whilst Wanda may have various connections with the government, and it’s venture into recreational cycling is taking advantage of the Chinese government’s policy of promoting sports, Wanda is still first & formost a private for profit entity. Wang wouldn’t have purchased the ironman brand or set up the deal with UCI if he doesn’t think either sports have huge potential in China either as Sport TV IP or mass participation events that promotes tourism (Wanda has interests in sports tourism, operating the largest Ski Resorts in China). To make these two sports work in China is how he will make money. If I was Chinese – and assuming I knew what my government does (most of the Chinese people I meet – students in the UK – know almost nothing until they come here) – I would want people to protest/complain/boycott on my behalf because I couldn’t. And I’d want that a lot more than I’d want to see 200 men on bikes. The Chinese people I know here in the UK very much agree. I suppose some would say the Giro didn’t stop in the 1930’s or that it’s a shame that the Vuelta survived through Franco. Ha, well I hope it generates a big new fan base, because I expect many of the cranky old school fans who comment here, and still want to see only euros racing and wearing wool shorts, smoking cigarettes after the race, will finally stop watching. Bye. I love it just the way it is. Drugs, Oligarchs, disfunctionalism and all. I love the mention of the Chinese co-opting billionaires into paying for entry into the world football scene. Contrast this with North America where billionaires co-opt local governments into paying for their (American) football teams. This is not great news to me, but for once I’ll leave the cranky rants to others. One thing about Chinese bike racing puzzles me. My wife was at the 2008 Olympic Games and tried to watch the cycling roadrace events. The Chinese authorities have big issues about crowds of people forming so she was constantly annoyed with being told not to stand, here, move away from there, etc. So how are Chinese bike racing fans supposed to watch these events? At home on TV? I realize F1, MOTOGP, Velon and the World Championship organizers in Doha don’t give a s__t about fans watching live vs TV, but these events lose a great deal without cheering fans watching live, in-person. Perhaps the organizers will put up cardboard fan cut-outs and play amplified crowd noise through loudspeakers? I think these races will have all the success of the Kent Tour of China or Tour de Trump, but the UCI coffers will certainly be replenished! The Beijing Olympics were a special case, the authorities were on edge because of events in Tibet earlier in the year, and since a certain event in 1989 are paranoid about large gatherings in the capital city. Things are likely to be much more relaxed in the provinces nowadays. It will be interesting to see the level of public interest, if it does go ahead. Cycling is on the rise here in China, and is attracting more wealthy middle class people. I live in Hong Kong and the number of recreational cyclists has shot up over the last few years. Football still rules, and, possibly due to the lack of history, supporters will switch from supporting one team to another on a yearly basis, depending on who is doing well. I don’t know how they will form an attachment to a non – Chinese team, unless they have high profile and possibly Chinese rider. Money shouldn’t be a problem, Wang and Ma are loaded, and Ma owns news outlets such as South China Morning Post, so advertising should be relatively easy. Side note, I’m moving to HK in January for a few years and planning to bring my road bike so this is good to hear. See you out there! I don’t want to put a dampener on it, but the surge in interest in cycling is not necessarily all a good thing for those of us who like to ride at a reasonable pace and with a regard for safety. For a start the roads here are often narrow and dangerous. The attitude of drivers stinks and this makes road riding very dangerous (a very good expat amateur rider was killed about 18 months ago by a delivery van while he was out training – the driver got a small fine and a short driving ban). Most keen riders I know are out at around 5.30 in the morning for a couple of hours before it gets too hot/busy. There are many cycle lanes but these are often poorly designed and littered with hazards such as bollards, drain covers, dustbins etc. It is illegal to ride on a road if there is a cycle lane available. Bikes always have to give way to cars where a cycle lane crosses a side road, and in every other situation. The greater interest in cycling means that at weekends in particular the lanes are now rammed with people of all abilities, including children on scooters, adults on bikes with training wheels, rented three wheelers with canopies on the back etc. Add in wheelchairs, prams/pushchairs, people pushing hand carts piled up with cardboard, groups of joggers, dog walkers, gangs of school kids to the mix. This will get worse as the population has risen by around 20% in the last 20 years and is due to continue rising for the foreseeable future. This is due to immigration from the mainland, where driving standards are considerably worse than in HK. Having lived in several countries I can confidently say that the local population is the most oblivious to their surroundings that I have encountered. Most are completely self absorbed and pay little attention to what’s going on around them when out walking. Everyone owns a smart phone, which has made it worse. Not that many locals own a car, and they seemingly find it hard to judge distance and speed, either in a vehicle, on a bike or when walking. HK is very competitive, and they also like to be first, so tend not to yield…. Depending where you end up living I would advise you to bring some hooks to hang your bike on the wall for storage. An average HK apartment is around 700 square feet so storage space is limited. Many locals ride folding bikes as that’s the only way they can fit them in their house. You see people in full Sky kit riding a Dahon! On the positive side, there is an active local riding scene, with a couple of clubs which cater for expats. If you want more info feel free to reply here. HK is like nowhere else, as you will see! Thanks Steve. That’s really useful info, much appreciated. We were looking at discovery bay, at least there are no cars there! I was there for a month last year and only saw one guy on a bike in central, but I was out in the New territories and saw a local cycle club, with kids in full sky kit. Does the velodrome have open sessions (slightly preferable to just going to the gym)? Are you in a club? (I’ve never bothered in the UK but was thinking of joining one out there). I guess early mornings await me! Oh, and do they still have that closed road public ride I think I saw advertised last time I was there? The images I’ve seen of Guangxi are amazing (just Google it). I hope the route takes full advantage of the natural beauty of the region. For this reason alone, this race should not be equated with the somewhat boring events in the Gulf where the UCI is simply chasing money. Is this a fish called Wanda, or does it smell that way at all? Put another way ASO & RCS kick UCI in the nuts by announcing team size reductions. UCI kick ASO & RCS in the nuts by announcing WANDA deal. If that is the essence, might such sore points scoring stuff be the equivalent of a bad saddle for the race riders themselves? China has made a lot of money by manufacturing many things for other companies, mostly western, who sell the products under their own trademark and business name. So the traditional draws for the sponsor of a team, namely, advertising and consumer brand awareness, whether for sausages, floor tiles, or even tourism to an unknown recently oil-rich nation, are not there for a Chinese company. That’s why you see more Chinese involvement in cycling via the promotion of new stage races, rather than the sponsorship of teams–with the new TJ Sport-Merida Team being the one exception. So what is the incentive for China to create new UCI races locally in China? To promote cycling for health and recreation, and sport? Yes, but also for the same reasons that Middle Eastern (and other oil producing) countries have recently created their own national tours–generally, to show off their national wealth. And the sport of cycling has been chosen as the venue to do this because you can (i) show it on TV, (ii) put on a big bright show by closing off the streets, stopping traffic, and having healthy, young, mostly white western (if you’ve ever traveled to China, you would know that this is an important criteria in itself) men and women riding through their streets, and (iii) give photo ops, with much fanfare, for local politicos and their crony businessmen. All this the UCI is more than happy to oblige–for an inordinate amount of fees, undoubtedly–regardless of what the pro teams think or say about it, and, more starkly obvious, regardless of whether anyone in China or the Middle East, or where ever these new races are cropping up, actually want to see, or even care about, cycle racing. The UCI might try to put on a straight face about it all by saying it is all for the promotion of the sport world-wide, but it smells like, looks like, and feels like them selling the soul of cycling for a fast few million Dollars, Euros, Yuans or Dhirams. “Selling the soul of cycling”. The biggest-selling brand of cycle ever is the famous ‘Flying Pigeon”. Until the last 20 years, the bicycle was perhaps the symbol of communism in China. Politicians in the West’s cities strive to free our streets of traffic and its pollution. It’s ironic that China has now fallen in love with the motor car, so any way that this can be slowed / addressed is surely welcome? Setting aside any concerns about the ethical right and wrongs of holding races in China or the Middle East the simple fact is those landscapes produce boring racing. Obviously both areas have mountainous regions but the simple fact is that watching cyclists chug along eight lane highways is boring. It doesn’t work. They might bank some cash in the short term but in the longer term it’ll never work unless they find more scenic landscapes. The same goes for the US really. I’m sure the right landscape exists somewhere in China, and at least the country has a cycling culture, even if it isn’t a racing one. But will the Government take the sport to those areas? Will the locals care? Once again the UCI openly chase’s the dollar/yen/euro, at the cost to the sport in general. This latest money making move has nothing to do with the Internationalization of bike racing, and everything to do with UCI finances. WT teams are now going to have to travel to distant parts, where their sponsors probably have little or no interest -AG2r. Like the ‘sand races’, most informed fans will simply ignore the event as having little or no relevance to pro bike racing. Whilst this sell out is taking place, the race calendar in Europe continues to contract. This latest move once again illustrates the level to which the UCI is conflicted, and rapidly becoming unfit for purpose. The fox should not be guarding the hen house. Sounds a lot like the Tour de Trump to me. Ruined bike racing in the USA for generations. “Ruined bike racing in the USA for generations.”? That’s utter nonsense. So we’re all happy to watch (and ride on) bikes / components / clothing that is manufactured in China and the Far East – for Western companies profit – but we don’t want them to gatecrash the party. Is the Chinese race on the ‘optional’ list of participation for the 2017 WT season? I dont, I dont want the Chinese crap they float over here by the ship load. Total shite the lot of it. Leave me out of that one Ecky. I try (whenever possible) to buy and promote cycling products actually produced in Italy by the company whose name is on them, rather than products produced in anonymous Asian factories with “brand” names applied to them. It seems to get harder all the time, but I keep trying. Surely the correct response to this race is just to ignore it? Zero impact on the races I love, will prob be rubbish, meh. I think I understand how this will work – they’ll PAY the Chinese fans to go out and watch these things! We laughed at Tour de Trump and now that snake-oil salesman will be President of the United States. Gawd help us all! I think this is where the new Wanda Deal differs from that of Tour of Beijing. Tour of Beijing is a government project, and it is natural for the local government to want to keep face and create an illusion of fans lining the road. So arranging old ladies & school kids out for a day maybe in order. The Wanda deal needs to make money and the business model is through making the affiliated mass participation events work. I don’t see how they can fill those events without having many real cycling fans around. That said, despite the scenic routes, the timing really isn’t conductive of good racing. Maybe they should have one criterium type of show racing and a real race together, so that fans can see the star riders as well as some genuine racing from otherwise ignored riders. The UCI are so desperate, they whore themselves out to whoever will pay. It’s all a bit pathetic. I can see a day, and I hope it comes soon, where we have a UCI world tour of races around the globe in places like China, the Arab states etc and stand alone races run by ASO, RCS and Flanders Classics. The teams will do the world tour for the giant race fees and the European races for the chance to win something meaningful. Not a good time for me in October, I’m flagged out with cycling well before then, recounting all the stages I have missed during the season because I simply do not have the time to sit and enjoy. The suns gone down on my interest by then and it tends not to rise until March. So put what races you want on wherever you want, I don’t really care I will be out on the bike!